I don't recall if anyone had any timing issues in February - I'm flexible, so if we need to change the date to accomodate someone, please PM me. Otherwise, if you plan to join us, post here! Last edited by Mhays on January 29th, 2009, 11:37 am, edited 1 time in total. Does it have to be on paper, or will "nr706, honor of your presence is requested at the Evanston Lunch Group of the Seventeenth Day of February in the Year Of Our Lord 2009" do? However, I may have a problem with the 17th. A couple of work-related interviews are being set up for that week, and Tuesday is usually their first choice. I'll try to nail it down on Monday and let you know for sure. I would hate to miss this! Tuesdays are out for me, even for a ELG lunch in Evanston. Sorry to miss it. I'll see you in March. (Tuesdays are fine in March, BTW). This date is good for me. Lunch during the rest of the week is pretty open for me, also. I'll be there. On the 17th I will be in Vegas, which for me has turned more into an eatin' town than a gamblin' town since LTH (don't know which costs me more money tho!). Have a great time @ Jilly's, and hopefully I'll be able to catch the next one! Since both Tarte Tatin and GAF and now jnm123 have a problem with that date, it's looking like we might reschedule...PM me if you have any preferences for that week. nr706 wrote: Date-wise, I'm easy. Do you have room for a newbie to the Evanston gang? I work from home now and it would be nice to talk to someone other than the dog in person. Although my dog is pretty interesting sometimes, especially when she gossips about the cats. There is a chance I might have to cancel since my work schedule is a little unpredictable. Assuming my client doesn't drop an emergency in my lap that day...looking forward to meeting you guys. Newbies are always welcome (of course, you'll be subjected to the initiation procedure ) Glad to have you! Also, those of you have responded, make sure you note that the date has changed! Many thanks for adjusting the date! I'll call tomorrow and make a reservation. I'm out. I have a 1:00 mtg now. How I hate 1:00 mtgs. I will try to catch you guys the next time around. I wish I could go just to see you all again, but I don't get paid til Thursday, so I'll have to stay home. I'm very eager to try more Evanston places with the lunch group in the future, though. And you LTHers farther north, are any of you up for a regular local weekday lunch -- or, if more convenient, Sunday lunch? La Casa de Isaac, perhaps? You should attend. nr706 is picking up the check... don't worry about it. Last edited by ChgoMike on February 17th, 2009, 3:56 pm, edited 1 time in total. I think I need to consult a lawyer about this. Does ChgoMike know a good lawyer? Great group, wonderful conversation, good lunch! 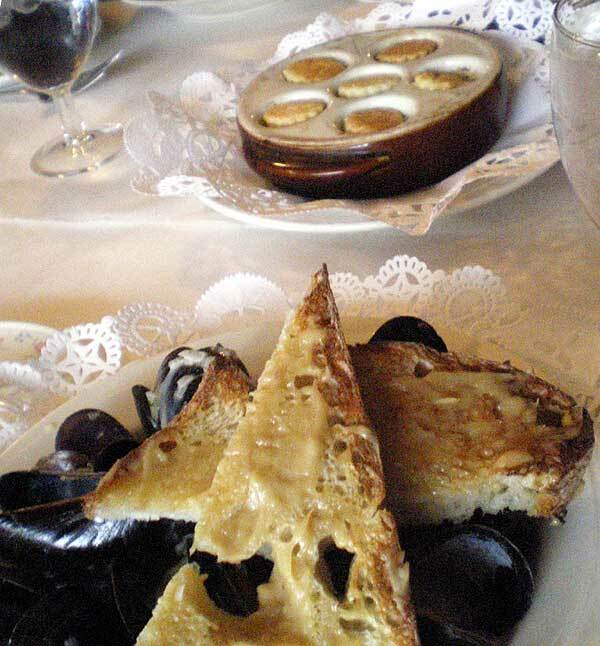 I think I liked the mussels best out of all the dishes we ordered. I could have eaten a whole order of those all by myself! I don't know why it didn't occur to me until I got home, but it was tarragon we were tasting in that yummy cream sauce. A look at Jilly's online menu confirmed it. I had not been to Jilly's in a loooong time before today, but I will think of going back soon for more of those mussels.... Thanks for organizing, Michele! You're quite welcome! I remember that the 'spouse and I had the same conversation about fennel/tarragon (and much of the same meal) the last time we were here. It was fun to have such an "intimate" lunch - and though we had six instead of eight, Jilly's is so tiny they could hardly hold us all. Good to see everybody! Thanks to Mhays for organizing. I've always liked Jilly's, but had only been there for lunch once before, and that was many years ago. I was surprised there was so much elegant food, yet we came away for $20 each. I thought the escargots were very nice - not rubbery, like they can be if overcooked, and with a restrained hand on the garlic butter. The mussels were clearly a hit ... some were better than others, but overall a great dish. There was minor fighting over soaking up the sauce with the excellent bread. Everyone ordered their own main dish. I'll start with mine. 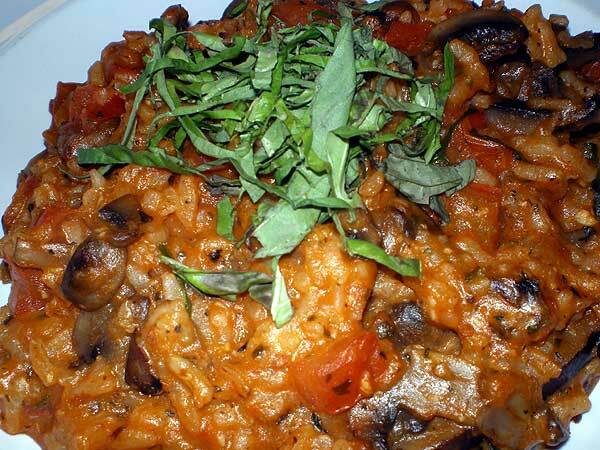 The Mushroom Risotto (huge portion) tasted much better than it photographed. To my mind, the mushroominess was there, but muted beside other flavors of tomato, herb and Parmesan. But overall, it worked. I took a half portion home and had it for dinner. Jason's Turkey, Bacon, Brie and Apple Club with Honey Mustard on Multi-Grain Toast was huge, with crispy sweet potato fries for texture. 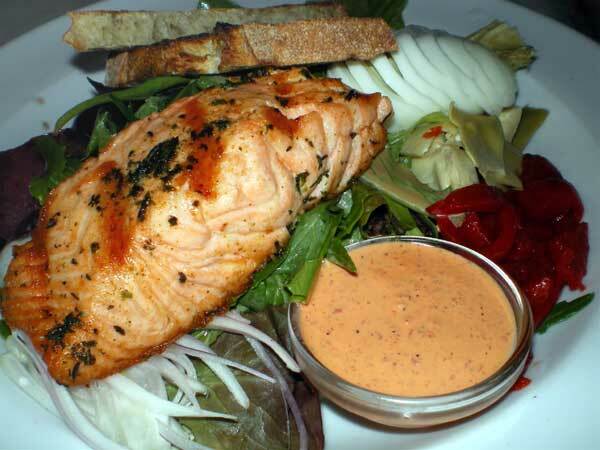 Ms. Jason had the special Salmon Salad - nicely done salmon, in an almost-niçiose-style salad. 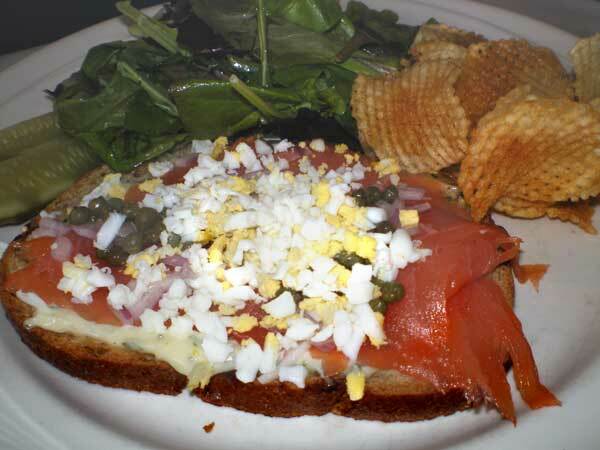 Meanwhile, tarte tatin continued the salmon theme, with her Smoked Salmon Sandwich with Tarragon Mayonnaise Chopped egg, Onion and Capers. I didn't get a photo of ChgoMike's Croque Madame, but, hey, he had a camera there, too. Overall, I was surprised at the quality/value at Jilly's for lunch. Service was also highly professional. Last time I was there for lunch, I wasn't focused on the food. 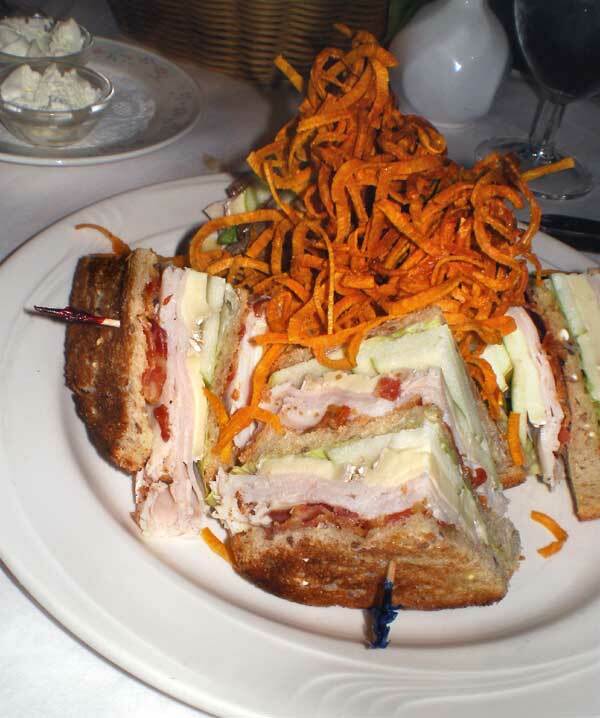 For me the sandwiches Croque Madame, the turkey, brie, bacon, and apple club, and the Smoked Salmon sandwich - and the Mussels were the best of lunch. Jilly's is nicely casual, while being nicely elegant. 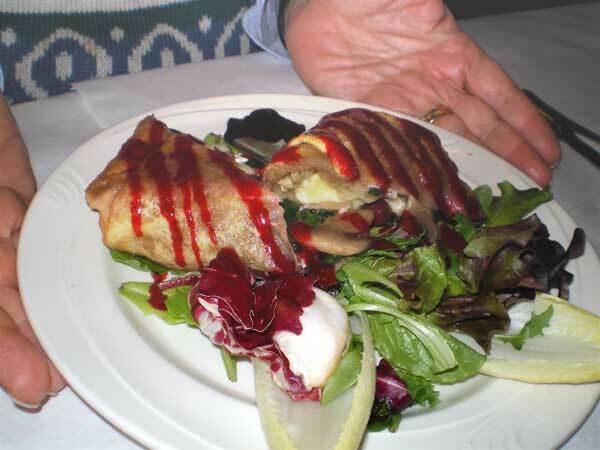 The spring roll with mushrooms, spinach, brie, and cherries was for me a once-in-a-lifetime experience. I won't ever order it again. I like Jilly's, within the confines of what it is: it's not innovative (or fails when it tries to be) but the food is carefully prepared and is just the way it's described on the menu. If something sounds good to you, you will generally find that it is good when you recieve it. For instance, I was surprised at how good the salmon on my salad was; it looked like it was going to be overcooked, but turned out to be nicely crisped on the outside and cooked just to doneness. The house-made dressing was a flavorful complement; the salad itself was OK, but would have been better without the canned artichokes and red peppers. The sandwiches were generally good, though in some cases the meats were just OK. I wasn't that fond of the risotto (overly tomato-y) or the escargots (overly garlic butter-y, though I'd agree they were restrained in comparison to other places I've had them,) but I did particularly enjoy the mussels and their very rich cream sauce.